Allan joined the council in 2017. Allan and Lynne have been attending Abundant Life Community Church for three years. They have two grown daughters, two wonderful son in laws and one two year old granddaughter. They currently serve ALCC as directors of Life to Life Ministries and greeting. Lynne also serves in children’s ministry. They have a heart to help people to see who they are in Christ and experience His love for them. Both work in education, Allan has been teaching for 27 years, the last 12 at Sumner High School as a business teacher. Lynne is a para-educator at Ptarmigan Ridge Elementary School in Orting. 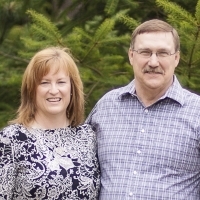 Allan and Lynne love God and His word and have a heart for the community, the church, and the world. In their leisure time they can be found enjoying the outdoors camping, kayaking, and hiking.